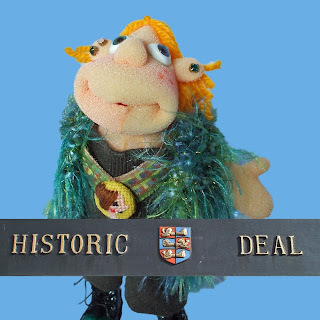 Tzipi went to Historic Deal, on the south coast of England. 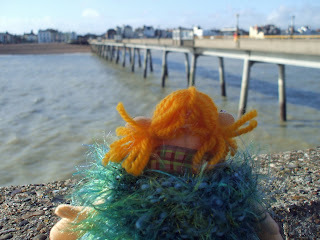 Deal is famous for many reasons, not least for being the birthplace of NiftyKnits. Deal's motto (Nifty didn't know this!) is appropriately : "ADJUVATE ADVENAS" which means "Befriend the Stranger". 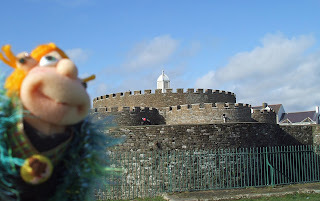 As a child Nifty liked to explore the dark tunnels in Deal Castle and climb on the cannons, so that's where we went. In these days of health and safety the tunnels are probably floodlit now, and the cannons barricaded off, so it's maybe just as well that the castle is still closed for winter! We headed down to the beach after snapping some souvenir pics. It was pretty windy so Tzipi was glad of her new sweater. We walked along the beach until we came to the Time Ball. 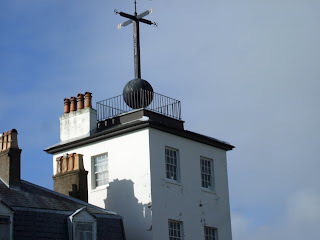 I've mentioned before that I used to think all towns had a time ball, but in fact they're very rare. 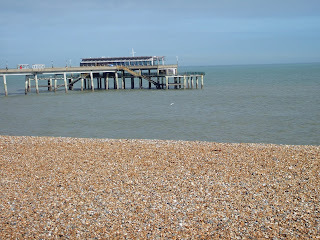 No trip to Deal is complete without a walk along the pier, so that's where we headed next. Look out! Is this another Health and Safety opportunity? We ended our day with a cuppa at Nifty's aunty's house. 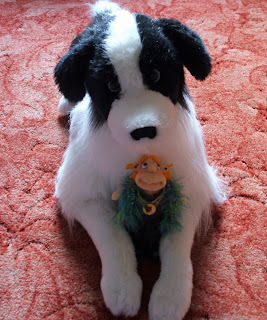 We'd had Health and Safety risks enough by now, but even remembering that Tzipi's mother Sharona of Raisinlike.etsy had warned that flutterbutts were a wolf delicacy, we decided to risk a snuggle with the toy dog! 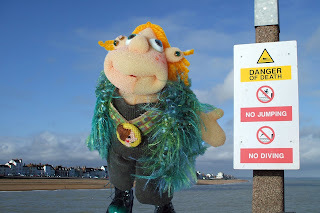 Tzipi is staying with Niftyknits for a few days more, she wants to be at her side when watching Harry Hill's TV show on Saturday - will knitted Harry Hill Meerkat get through to the final???? 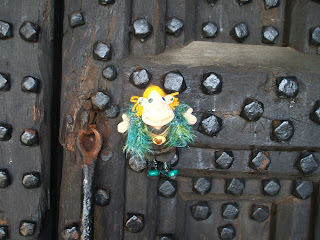 Keep track of her adventures at Sharona's blog. Such exciting adventures! And Tzipi looks so yummy in her new cardi, which matches her romper perfectly. Hopefully, watching the show will be okay in terms of health and safety? 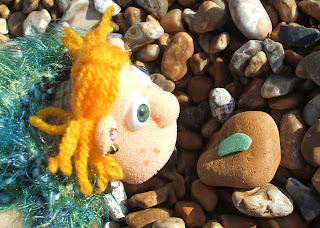 Love Deal Castle ~ Tzipi looks like she's had a fun day! 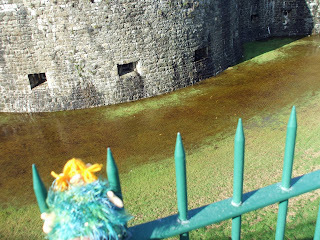 The tunnels under the castle were flooded when I visited last year. Tzipi would have needed wellie boots or even waders! I look forward to her further adventures! Tzipi does have pretty substantial boots (after all, I expect she's done her National Service in Israel). Sharona, I guess Health and Safety risk will depend on whether there is a need to pop champagne corks. Fingers crossed! Hoping for champagne cork popping. Enjoyed reading this adventure. Haha .. I'm quite jealous of the adventures actually!! I know you probably get a lot of Sunshine awards passed to you, but I wanted to let you know that you have another from me. I've posted a reason why on my blog. WOW what an exciting day Tzipi had and NO SNOW !!! Tzipi definitely picked the correct colour for her new jumper !!!! WOW what a day Tzipi had, Loved the new Cardigan she got. And good luck with the contets!! !